We serve all of your cheese industry needs! As a cheese industry executive and professional, you are hungry for the most accurate, timely cheese-related information you can get...and you want it in a format that's easy to understand and read. 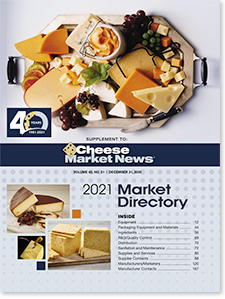 CHEESE MARKET NEWS is dedicated solely to your industry, and we're committed to being your eyes and ears so that you can effectively and efficiently run your business. You can order your 2019 Market Directory in print by clicking here.